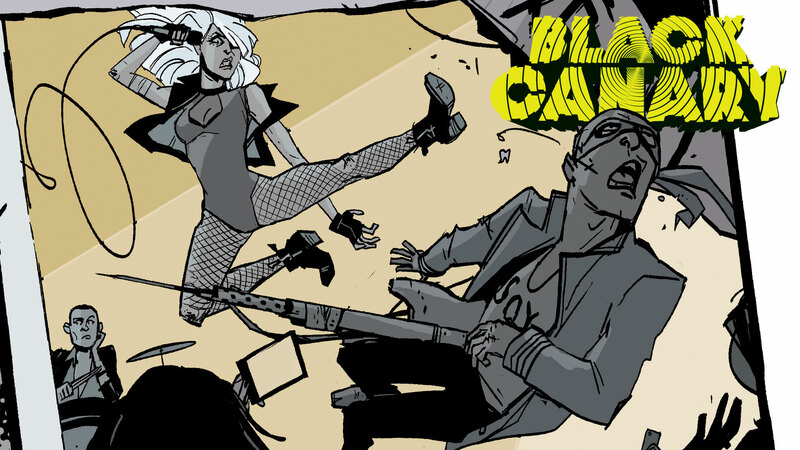 Get to Know Black Canary, the band behind Black Canary Vol. 1: Kicking and Screaming! Who is Black Canary? Great question. If you’re an average music fan, you probably know that the band is a four-piece out of Gotham’s hippest suburb, Burnside, with a brand new, critically acclaimed EP Kicking and Screaming. Well, with their newfound success Black Canary is ready to take the show on the road, and will be touring with their explosive debut! Check out the band live for a show you’ll never forget! DISCLAIMER: You may also have heard that hitting a Black Canary gig is a potentially dangerous endeavor if untrained in self-defense. Um, this is true, but go anyway! Lead singer of Black Canary, D.D. is as mysterious as her initials. Her one-of-a-kind voice propelled Black Canary onto the music scene, but that’s about all we know about her. When questioned for her real name, D.D. offered only a playful wink before returning to load-out. A musical mastermind who has a taste for success and a drive for business. Shepherding the band to stardom, she will always have her band mates back. Keys and strings extraordinaire, there isn’t much Paloma can’t do—she can even fix your car! But don’t mess with her. She’s got killer aim and will do anything to protect the people on her good side. The petite guitar protégé doesn’t need to speak to be heard. The way she shreads on her guitar has made her one of the most standout members of Black Canary, and object of other band’s desires! A blend of electronic beats and killer riffs, Black Canary has crashed onto the charts and has sent shockwaves across the nation. Their sultry lyrics and punk rock attitude has captured the hearts of many, and with a growing fan base they’re ready to melt faces and conquer anything and anyone who stands in their way!